This report categorizes where your visitors are coming from, typically based on the referrer, with one exception (for 'Advertising'). There are currentely 8 different categories, as explained below. Each visitor is only assigned to a single traffic source when we process their visit. Direct - Visitors with no referrer. This doesn't necessarily mean they typed your site directly into their browser. 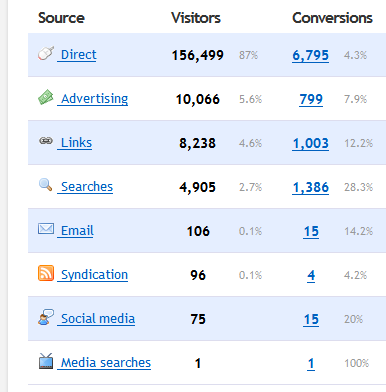 Advertising - Visitors who arrived from a known advertising domain. We also categorize all campaign visitors into here. Searches - Visitors who arrived from a known search engine domain. Email - Visitors who arrived via a web mail domain. We can't track desktop apps such as Outlook because that won't send a referrer, so it's only web mail. As well, most web mail domains are also secured with HTTPS, and browsers don't send a referrer when going from HTTPS -> HTTP. So chances are you won't see many of these unless your site is full time HTTPS. Social media - Visitors from social media sites, as well as t.co links (visitors from links on Twitter). Syndication - Visitors from known "RSS reader" sites, such as Digg Reader. Media searches - Visitors from the image search on Google, Bing, or Yahoo. Links - Any referrer that didn't match one of the other categories, such as social media. Why do I have so many direct visitors?